Come and explore mysterious depths with the "Haunted Appalachian Caverns GhostWalk". Recently voted one of the best ghost and history tour companies in the nation by USA Today 10Best, 16 different Lantern-led walking tours operate year-round with advance reservations. Prices vary according to the number in your party and advance reservations are required. 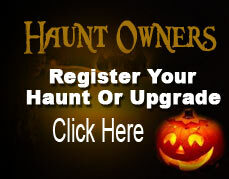 Haunted family-fun vacations appropriate for children as well as the young at heart will thrill and amaze you and your companions and are very budget friendly. Plus, ten percent of the company's annual profits go to benefit St. Jude Children's Research Hospital. Southwest Virginia and East Tennessee Ghost and History Tour locations include the towns of Jonesborough, Greeneville, Johnson City, Bristol, Abingdon, Blountville, Erwin, Rogersville, Elizabethton, Dandridge, and Gatlinburg in the Great Smoky Mountains. Call (423) 743-WALK (9255) for information, availability, and reservations and get set for a simply SPOOK-tacular good time with real ghosts and real history!! !